It’s a mouse! Not a pointing device, a mouse! Those of you not fortunate enough to live in the great Commonwealth of Massachusetts may have heard about our new Governor, Deval Patrick. Only the second African American Governor in American history, Patrick, a first time candidate for any office, won both the primary and the general election in a knockout. Hailed by his legions of die hard supporters as an agent of change and a true liberal, the expectations for Patrick were sky high after 12 years of failed Republican Governors. But after gliding through a virtually flawless two year campaign, Patrick has been nothing short of a disaster during his first two months in office. Running against Attorney General Tom Reilly, who was never a true Beacon Hill insider, but nevertheless an old White Irish guy, Patrick represented something new. His supporters counted on him to be the renegade outsider who would put an end to the patronage and special interests that have dominated Massachusetts politics for so long. He pledged to fill his cabinet with fresh faces, and flush out the backroom cigar smoking insiders who know their way around the State House better than their own living room. In his first two months in office he has done just that, and it shows. After a weeklong series of inaugural balls and galas celebrating himself at a cost of more than one million dollars, Patrick was mostly silent during his first month. Aides said he was quietly working on where to make cuts in the state budget to help offset the tremendous deficit. While cuts were made in some areas, others saw a rather healthy increase in spending. For example, there was a hefty increase in the area of office drapes. Patrick spent $12,000 dollars on fancy new drapes, and another $15,000 on new couches and other furniture for the Governorâ€™s office, courtesy of the taxpayers. Another area that saw an increase was â€œGovernorâ€™s official state car,â€ which has traditionally been a reliable but modest Ford or Chrysler. For Patrick, itâ€™s a fully loaded Cadillac Coupe Deville, for a mere $46,000. Itâ€™s truly amazing that someone whose entire campaign was based on symbolism and rhetoric would fail to see the problem with a multi-millionaire Governor spending $83,000 in taxpayer money on new furniture and a suped-up Cadillac. It was only after the Boston Globe reported on this for four days straight that Patrick partially reimbursed the state for his new office furnishings and fancy wheels. Mistake number two came the same week, when it was revealed that the administration had made up a new position in state government titled â€œChief of Staff to First Lady.â€ Since Patrickâ€™s wife has no official state duties whatsoever, she does not actually have a staff, but she did have a Chief of Staff. Amy Gorin, a campaign contributor from Wellesley, the fourth wealthiest town in Massachusetts, was briefly in charge of Diane Patrickâ€™s â€œSchedulingâ€ for a mere 72,000 taxpayer dollars per year. The really pathetic thing about this is that Ms. Patrick does not need someone to handle her calls and schedule her appointments, since she already has a secretary. The reason I know that is because her secretaryâ€™s phone number is listed right here on Ms. Patrickâ€™s bio on the website of Ropes and Gray, the major Boston law firm where Ms. Patrick is a partner. After the Boston Globe reported on this, Gorin resigned and her position was eliminated. But public relations mistakes are merely signs of a rookie who does not understand the nature of his office. The real reason that I spent a year and a half warning everyone I spoke to not to vote for Deval Patrick was because of where his heart really lies: itâ€™s not with the grassroots activists he energized, or the working class he claims to represent, itâ€™s with the big businesses whose corporate boards he served on that helped get his campaign off the ground. Most disturbing to me was his service on the board of directors for Ameriquest, the predatory lending firm run by Roland Arnall, the single biggest contributor to President George W. Bush in 2004. (Click here for some further reading on the moral giants at Ameriquest.) Patrick made over $1.5 million for his service on the board, money made mostly off the backs of poor minorities, and money that he used to kick-start his campaign. During the campaign, Patrick used poetic slogans and inspirational speeches filled with glittering generalities, masterfully selling to the public the utterly fantastic notion that his deepest sympathies lay anywhere other than with corporate America. After the dÃ©cor and Cadillac fiasco, and the assistant for his wife, Patrick showed his true colors with mistake number three. In mid-February, Patrick placed a phone call to former Clinton economic chief Robert Rubin on behalf of his former employers, Ameriquest. Rubin is now a top executive at Citigroup, a major financial services company. Patrick called to urge Rubin to lend economic support to Ameriquest, which was badly in need of financial help. Apparently aware that a Governor is not supposed to be trying to influence private business transactions, Patrick claimed he was not calling as Governor. â€œI made this call solely as a former board member,” Patrick said. Sorry big fellaâ€™, but youâ€™re the Governor whether youâ€™re swearing in a Judge, kicking your feet up in the corner office, or taking your kids to Chucky Cheese on a Saturday. When you call Robert Rubin, heâ€™s not thinking of you as a private citizen who once worked for Ameriquest, heâ€™s thinking of you as the Governor of Massachusetts. Perhaps this series of pathetic moves can be explained by looking at who the Governor has surrounded himself with in key positions. Think the era of patronage jobs is over in Massachusetts? Puh-leeze!!!!!! Consider Patrickâ€™s appointment for Deputy Chief of Staff. After a nationwide search and a review of thousands of resumes, Patrick settled on 25 year old Brendan Ryan. (Ever seen The West Wing? Itâ€™s Josh Lymanâ€™s job for the Commonwealth of Massachusetts.) For further reference, Patrickâ€™s predecessor Mitt Romneyâ€™s Deputy Chief of Staff was Renee Fry, whose previous occupation was the Director of the Department of Business and Technology, and prior to that she was the Undersecretary of Economic Development. For all of Romney’s faults (and there are plenty) his administration hit the ground running. Brendanâ€™s previous occupation: driver for Deval Patrick during the Deval Patrick for Governor Campaign. (Yesâ€¦driver. As in, he drove the car and parked it at the event and then drove it to the next event.) Heâ€™s 25, and the number three man in the Governorâ€™s office, at the mere cost of 95,000 taxpayer dollars per year. If that doesnâ€™t say â€œPolitics as usual,â€ I donâ€™t know what does. How does this sell? You can buy chocolate, or vanilla, or strawberry, in any proportions.But instead, you choose to get exactly equal portions of each, all shoved in the same container, why? Why would you limit yourself like that? You can’t even eat your favorite falvor in isolation. You eat vanilla, some strawberry’s gonna get in. That’s just how it is. And strawberry. Strawberry? What the heck is strawberry doing there? Who, at any time, would rather eat strawberry than chocolate or vanilla!? This was meant to be rhetorical. But informal polling has convinced me that there’s an awful lot of strawberry weirdos out there. To all of them I say, you are seriously weird. Seriously. Growing up, my father would occasionally purchase neapolitan, just for kicks. And our family would destroy the chocolate and vanilla in about, oh, 35 seconds. The strawberry would just sit there. And sit. A few months later, my father would get a strange urge to buy another carton of neapolitan, and it would repeat. Eventually there would be three or four boxes of ice cream left, each with one carefully sculpted strawberry third remaining. Once in a while, my father would see these and begin to lecture us about waste and how much things cost. It’s hard to believe they are still the most popular flavors. And indeed, they are not. Per the International Ice Cream Association, here are the top 10 flavors. (Isn’t it funny that neapolitan is counted as it’s own flavor?) So it seems that the strawberry should be replaced with butter pecan. Which just sounds sickening, honestly. That site has other gems. We all know the “I scream, you scream, we all scream for ice cream!” song, right? Well, they have the complete lyrics! No, they really don’t write ’em like that anymore. They’d get picketed. Weightlifting has many benefits. The obvious one is increase of muscle mass. Most people don’t realize the real work of the body is not during the workout, but after. In a really good workout with weights, you work the muscles to failure. That means actually killing off many off the fibers and tissue. Over the course of the next few days, the body works to repair the muscle, and make it better. This is why you alternate body sections — the idea is to give any given muscle a few days to recuperate before killing it off again. (Note that many people don’t work out this way, you still get plenty of benefit even if you don’t work all the way to muscle failure.) The re-creation of the muscle is what burns the calories, it takes a lot of work and energy. Likewise, when you suffer any kind of injury, your body needs energy to recuperate and rebuild it’s systems. Many of us have lost those few key pounds when we have a virus. When you run a fever, your body is literally cooking itself. Fighting disease takes energy, and recuperating afterwards does also. Blood loss is one such injury. When you give blood, your body needs time to recuperate. That’s why you’re supposed to take it easy for a few days afterwards, your body needs time to rebuild. This logically leads to an obvious weight-loss strategy. Donating blood five times a year not only is the right thing to do (go here for more info, or just get in touch with me directly), you can lose weight while doing it! Now that’s a win-win! And if you can’t give blood, at least get sick every so often. This is a piece of marketing material I got recently from some stupid company. It abounds with poor reasoning. Does your [system metric] surpass a 70% succes rate (outperforming the industry average of just 30%)? Does your [other system metric] exceed 25% (putting the industry’s 5-7% average to shame)? Why, no it doesn’t. You have me interested. Pray, continue. You have lost my interest. I have not bothered to work out the statistics, but if the average is 30%, out of the 5,700 clients you quote later, the fact that some of them might get very high metrics, simply by chance alone, seems rather… obvious. Furthermore, all clients are different, there are always those that by the nature of what they do get higher scores at any given metric. yes, even ones who [do a lot of this]. No, really? You think there might be a little cause and effect confusion? Maybe they do more because it works? Or maybe they do more, so they spend time making sure it works? And [our company] is one of the reason why. One of the reasons? Boy, you’re really going out on a limb there. It bugs me when people say statistics is just lies. It isn’t, it’s a technique that can be used or misused. Jackholes like this companies’ “Sales Manager, Strategic Marketing” don’t help. Author MuttroxPosted on March 23, 2007 Leave a comment on Stupid Stupid Marketing Creatures! Whose Face Do You See in the Mirror? I’m at the age where I’m starting to see my fathers face in the mirror. But this made me think, why my father? Why not my mother? Do I just have stronger memories of my father from this age? Do boys instinctively compare themselves to their father, and girls to their mother? What about you? Whose face do you see? Author MuttroxPosted on March 21, 2007 2 Comments on Whose Face Do You See in the Mirror? To watch anything, you have to use at least 3 remotes â€“ 1 to turn on the receiver and switch to the correct input, 1 to turn on the TV, and 1 to control the component you wanted to watch (VCR, DVD, or cable). As a techie AV guy, I was completely fine with this setup, but youâ€™ll win the bet if you guess that it drove my girlfriend crazy. Like most women, it took her forever to figure out what remote did what, and she was always worried that sheâ€™d hit the wrong button and mess up all my carefully calibrated gear. Program it from my Mac? Control everything with one button? Where do I sign up!!! This remote control is a miracle. Why didnâ€™t someone think of this ten years ago? 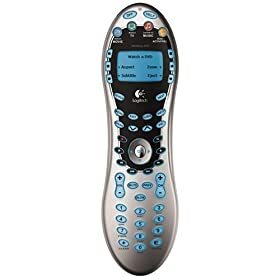 Weâ€™ve all seen the so-called â€œuniversal remotesâ€ â€“ huge things with a thousand buttons that claim to control all your gear, usually with a fancy name like â€œRemote Commander!â€ They all worked on the same principle â€“ on the top row of the remote, you click which component you want to control, then click the buttons below to perform a task, then click the component button of the next thing you want to control, etc. Took forever. And who could remember what all the buttons did, since each one had multiple functions? – start playing the DVD! How great is that? All from hitting one button! The remote does all the work! Can you guess what the other buttons are? Thatâ€™s right â€“ obvious things you want to do, like â€œwatch TVâ€, â€œlisten to musicâ€, â€œplay a gameâ€, etc! Hereâ€™s how this Holy Grail works. You load the Harmony software onto your Mac or PC, and then type in the manufacturer and model numbers of all your gear. The software downloads the right codes & info from Logitechâ€™s online database and uses the USB cable that comes included to program your Harmony remote for you. If you want to be geeky (you bet I did!) you can configure your remote down to the tiniest detail, controlling what functions appear on the remote’s screen (and in what order), or even mapping specialized buttons onto your remote. Once your remote is configured, you can test everything and the remoteâ€™s Help function can make adjustments if anything is still not working perfectly. It truly, honestly, 100%, does not get any better or easier than this. I got the 670 model because it was marketed as the best one for controlling a DVR. At Best Buy, it was $150, but on Amazon, it was only $100 plus $5 for shipping. You may cry out in shock, â€œA hundred dollars? For a hundred dollars, Iâ€™ll gladly juggle all those remotes and hit all those buttons myself and save the money.â€ If thatâ€™s what you sayâ€¦ then you, sir, clearly donâ€™t understand what is important or fun in life.